Moving on from the cavern with the symbols carved into the walls, Gerry our Aborigine friend wanted us to climb further up the hill, which gave a magnificent view through the gum trees out to the sparkling blue bay. He led us to a place where he told us he liked to perform healings with his crystals. Crystals he said had been used for healing by his Bundjalung tribe since creation. 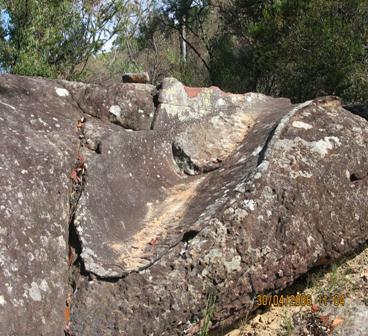 On a large flat rock, we were shown to one side a naturally formed cradle in the rock where he said the women in bygone years had used it as a bed to have their babies. There were small water pools nearby and soft earth. He asked us to lie in the cradle to see what we would experience. Helen lay first and drifted into an altered state of consciousness. We noticed that no insects came near her even though it was a warm day. She later felt strange and not thinking too clearly she claimed she had felt the ecstasy of birth, but also felt abandoned, yet she knew she was not alone. This was odd. Gerry had asked her, “What about the baby?” He didn’t know why he said that either. Helen wanted me to lay in the cradle. I found I drifted into an altered state also, feeling very calm but after awhile I returned saying, “It had been a great honour to give birth” So what was that all about ? The feeling was mystical and we knew we were not alone. 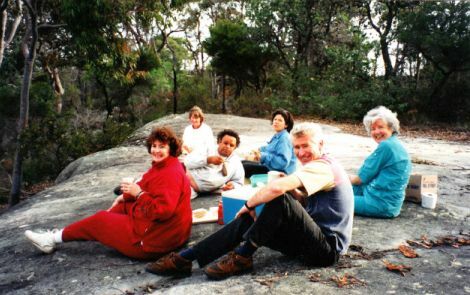 That moment left us and we merrily moved on to another flat rock that had a huge whale carved upon it, where Gerry suggested we have our picnic and just talk quietly. He had already pointed out areas that used to be men’s business places and then to women’s business places. We are all psychic and could feel pleasant spirit ancestors hanging around. As the late afternoon closed in it was time for us to leave. I hastened to the boot of my car to give one of our friends something and promptly locked the car keys in the boot. Oh, darn !! we were a long way from help. Hadn’t Alcheringa said he would give us the keys, but now… . he had taken them away!!! Helen and Gerry stayed with my car, while I gained a lift with the others to the local town. I had great difficulty in telephoning for help – I couldn’t make myself understood; the numbers were not correct and I was becoming more frustrated by the minute. Finally help did come and I arrived back to Gerry, Helen and car, to release the keys. The three of us were standing closely …. when all together we experienced the same past life memory. Something terrible had happened and we were wailing and crying. I was shaking badly and said, “We are star people, we have lost our huge mothership the Rexegena”. ….and wept and wailed along with Helen and Gerry, we couldn’t believe it had happened. In our sense of hopelessness we knew that an escape ship had been damaged and gone into the water in the bay. Helen and Gerry knew they had been in it. I was in another ship that had followed it, hoping to give help. That memory had been reflected in me in sheer frustration, when I had tried to get help by opening the boot of my car to retrieve the keys earlier. More unfolded as the week passed. Helen and I kept ringing each other with more memories and Gerry had left to go overseas to the U.S.A. Others heard about our adventure and rang me often saying they felt connected to the same story. Most of the people didn’t know each other and yet all they had to do was sit with the photos of the symbols from the rock walls and they would spontaneously regress into the same Past Life story, but their memory would be from a different point of view. Alcheringa was right, it was as if an unseen hand was at work, bringing the story forward through many people. It was a time when genetic engineering had been performed by the star people to create the up-standing ape like creature into evolving into the human we have become. I believe the first children were the Aborigine who the star people called, “The cherished ones.” They have inherited the star people’s psychic abilities and have always known that God is in everything. My 2nd book “Alcheringa, when the first ancestors were created.” relates the stories from those off the Mothership Rexegena, that were told to me and who attacked it. I want to rename the 2nd book to “Star People Revisited” and am looking for it to be republished. You may view some of of the symbols carved into the walls of the cavern, there are about 250 of them. (View the images here, in this Photo Album) Maybe you, the viewer may connect to the energy of them and begin to remember …. Upstairs has told us that everyone in this Galaxy knows the story … not all were involved with the story but it is in everyone’s heart. 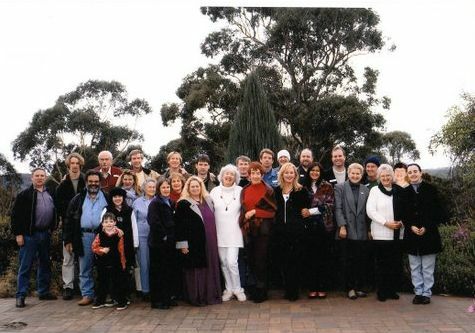 A MOTHERSHIP REUNION was held at Canyonleigh in 2001. The Mothership Rexegena came from the Pleiades 900,000 years ago, with 50,000 star people on board. The Mothership was destroyed and only 90 star people survived – they struggled to survive the difficult atmosphere which was too hot for them and infested with bacteria that attacked them. Despite this they formed a small community. The photo below shows some of the people who remember being off the mothership. At the reunion, many of them had not met each other before. 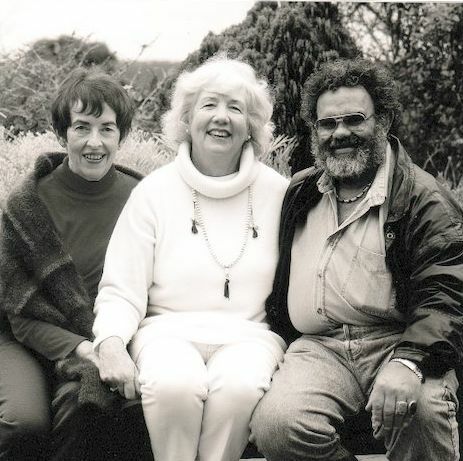 The photo below is of Helen, Val and Gerry who first experienced the Star People’s memory together….which became the beginning of the story. The names given to us in the memory was Elouera, Egarinna and Ujeshet.